"Super Combiners" was the project name, even before we designed our way through a sequence of rotational joint constructions. The idea is that any paper toy which uses the same size holes and the same size connectors can mix and match parts with each other. 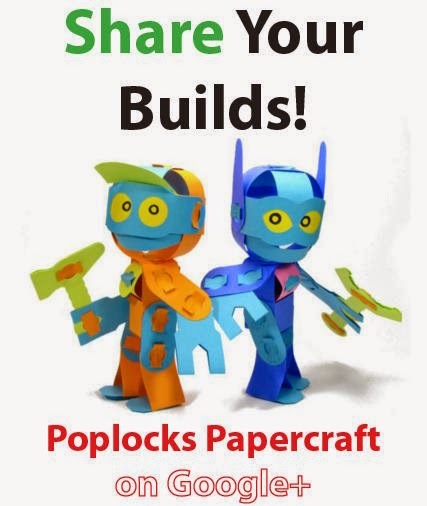 Any paper toy can be more than a paper toy, it can be part of a paper toy system! Poplocks aren't the only type of fastener that can be made either! If you look around the web, you'll find that people all around the world have already designed novel ways of getting paper parts to fasten and move! From SF Papercraft's Shunichi Makino (Star Wars AT-AT), to Kami-Robo (tied wire holding all those wrestlers together), to Rob Ive's 2-axis-joint (compact and efficient!) and back to Kami-Robo (the Ole 34 cm robot kit - check out how those connectors work!) and many in between of course. It's going to be interesting to see what comes after this.